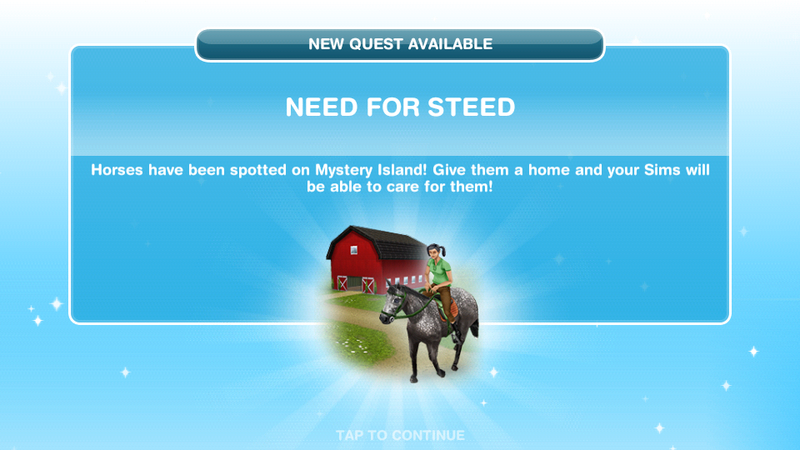 "Need for Steed": available at level 11 onwards. Quest "Need For Steed", if finished in time (7 days), you unlock a rainbow powered Unicorn painting. As of the Glitz and Glam update this quest has changed. Time available is now 2 days!!! 13. Clean up the mess in yard with your Sims (you need at least teenagers, look for the exclamation marks! You finished the Saddle Up quest. If you finished in time you've unlocked the Unicorn Painting (you still need to buy it). The quest "The Hidden Unicorn", which unlocks the Show Jumping area and hobby, will start on the 22nd of May! (One of your Sims is curious about this new Mystery Island that has just opened up! Send them for a drive in a car to check it out! (Do your Sims eyes deceive them, or was that a horse wandering around between the trees? Best check to be sure! Tap a telescope and choose 'Look for Horse'. (There's the horse! Near that volcano! Your Sim should go over for a closer look. (Interesting! It seems there is a whole Stable near the volcano! Or at least there used to be. It's very run down and overgrown now so you'd better bring your Sim inside and start building! (What? The gate is locked! But what's this? A note is attached to the gate with a phone number written on it. Perhaps it’s the owner's number? (The Sim on the other end of the phone said that the Stables belongs to them, and there's no way they'll just give it over to someone like your Sim who doesn't understand horses and how much love they need. (Now your Sim has a great understanding of what goes into horse care. Call the Sim back to convince them that your Sim knows what they're doing! (The Stables owner says he'll give your Sim a chance to prove themselves but they don't have the keys to the place anymore. You'll need to get a locksmith down there pronto! (Wow! On closer inspection this isn't just an old barn but a whole Stable, or at least it used to be. It's very run down and overgrown now. Better bring your Sim inside and start building! (Well the barn is built but not much else. And what a mess! The yard beside the barn is blocked by a big oil drum. Have a Sim get it out of the way! (Excellent! That's gotten the yard open but there's a lot of mess inside! Too much for one Sim to handle! Call over some friends to help out! (Now there's a few eager hands ready to help out! Let's get cracking! (Wonderful! In order to get the hobbies operational your Sims will need to do a lot of clearing and tidying up like this! Now before your Sims think about getting a horse they really need to be schooled in the art of horse care and proper animal treatment. There's a fantastic horse channel on TV that would be perfect to watch! (One of the best things about owning a horse is brushing its long mane. It can be very therapeutic but still requires some careful technique. (What beautiful brushing! Horses also love encouragement and attention. Have a Sim encourage another Sim to make sure they have the hang of this. (Almost ready for your new Neigh-bour! First your horse will need somewhere to hang its horse shoes for the night though. (To own more horses, your Sims will need to repair more of the barn. Let's see what the owner of the Stables thinks now! (Wonderful! The Stables owner is pleased as punch with your Sims' efforts. Because of all your hard work, the Stables are yours! It's time to introduce the horse to their new home. (How exciting! 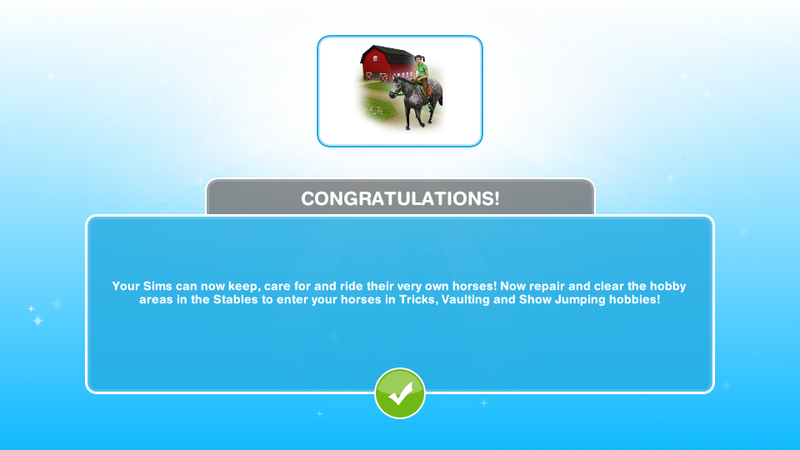 Your Sims now have their very first horse! But something's wrong. See how the horses head is down? It looks sad. Whenever a horse is sad, your Sims can feed, pat and groom it to raise its happiness level! Have a Sim feed the Horse.